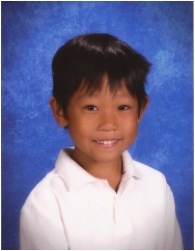 First-grader Jared Ang attends Harding Elementary School in California. His poem, “In the Rain Forest“, was selected as a Top Ten Winner in the K-3 age division for the Fall 2012 poetry contest. Jared’s hobbies include reading, swimming, practicing karate, and playing the piano. He also enjoys watching TV. His favorite movies are Madagascar, Ice Age, and Wild Kratts. These movies helped to inspire Jared to write his poem about the animals in the rain forest.